The “right of the people peaceably to assemble, and to petition the Government for a redress of grievances” protects two distinct rights: assembly and petition. The reference to a singular “right” has led some to assume that it protects only the right to assemble in order to petition the government. But the comma after the word “assemble” is leftover from earlier drafts that made clearer the Founders’ intention to protect two separate rights. While neither “assembly” nor “petition” is synonymous with “speech,” the modern Supreme Court treats both as within an expansive “speech” right, often called “freedom of expression.” Many believe that focusing singularly on an expansive idea of speech undervalues the importance of providing independent protection to the remaining First Amendment rights, including assembly and petition, which are designed to serve distinctive ends. Assembly is the only right in the First Amendment that requires more than one individual for it to be exercised. A person can speak alone; one cannot assemble alone. While some assemblies occur spontaneously, most do not. For this reason, the assembly right includes planning, organizing, and other activities leading up to the physical act of assembling, protections later recognized by the Supreme Court as a distinct “right of association,” which does not appear in the text of the First Amendment. 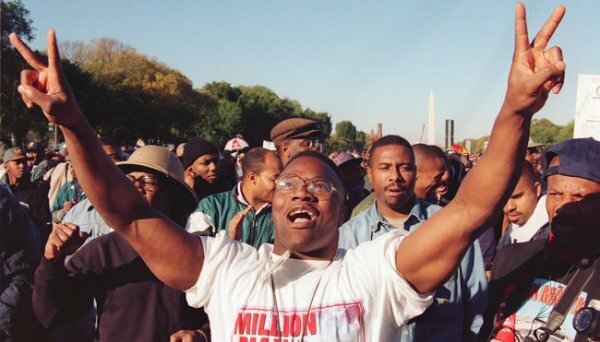 Marchers at the Million Man March in support of the African American community on October 16, 1995. The right to “petition the Government for redress of grievances” is among the oldest in our legal heritage, dating back 800 years to the Magna Carta and receiving explicit protection in the English Bill of Rights of 1689, long before the American Revolution. Ironically, the modern U.S. Supreme Court has all but read the venerable right to petition out of the Bill of Rights, effectively holding that it has been rendered obsolete by an expanding Free Speech Clause. As with assembly, however, the right to petition is not simply an afterthought to the Free Speech Clause. 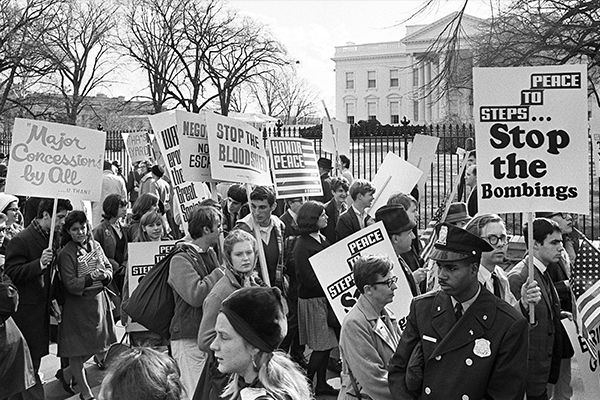 The right to petition plays an important role in American history. The Declaration of Independence justified the American Revolution by noting that King George III had repeatedly ignored petitions for redress of the colonists’ grievances. Legislatures in the Revolutionary period and long into the nineteenth century deemed themselves duty-bound to consider and respond to petitions, which could be filed not only by eligible voters but also by women, slaves and immigrants. John Quincy Adams, after being defeated for a second term as President, was elected to the House of Representatives where he provoked a near riot on the House floor by presenting petitions from slaves seeking their freedom. One of the risks of representative democracy is that elected officials may favor the narrow partisan interests of their most powerful supporters, or choose to advance their own personal interests instead of viewing themselves as faithful agents of their constituents. A robust right to petition is designed to minimize such risks. By being forced to acknowledge and respond to petitions from ordinary persons, officials must openly defend their positions to their constituents, enabling voters to pass a more informed judgment. The right to petition is contrasted with the right to instruct. A right of instruction permits a majority of constituents to direct a legislator to vote a particular way, while a right of petition merely means that government officials must hear from members of the public. The drafters of the Bill of Rights decided not to include a right of instruction in order to encourage legislators to exercise their best judgment about how to vote. Today, in Congress and in virtually all 50 states, the right to petition has been reduced. Petitions entered on the public record are typically not debated or responded to. In a political system where long-serving legislators can make it all but impossible for challengers to mount an effective campaign to unseat them, an energized right to petition might link modern legislators more closely to the entire electorate they are pledged to serve. Some scholars have even argued that the Petition Clause includes an implied duty to acknowledge, debate or even vote on issues raised by a petition. However, the precise role of a robust Petition Clause in our twenty-first century democracy cannot be explored until the Supreme Court frees the Clause from its current subservience to the Free Speech Clause. Section Objective: Students will begin to more deeply understand appreciate their rights to petition and assemble. Through exercises and discussion, students will be invited to respond actively to challenges in their country. Have you ever engaged in any forms of petition or assembly? What for? What were the circumstances? If you haven’t petitioned or assembled before, why not? What methods would you use to petition the government for something you care about? What would be the most effective ways for your voice to be heard? identify contemporary political issues through discussion. Supplies: Paper, pens, pencils, markers, crayons, poster board, cardboard, any and all art supplies you may have on hand. What are some causes that matter to you? If you could change one thing in the world right now for the betterment of humankind what would it be and why? Do you actively fight, assemble, and petition for that cause or grievance? Why or why not? What sort of circumstances will bring you out to fight for a cause? Students are divided into groups. Each group is assigned a ludicrous belief that they have 20 minutes to generate a propaganda campaign for / against. Students can create art, visuals, marches, songs, chants, posters, films, etc. When we did this with our students, one group even created an actual Instagram account sponsored by their “campaign” to help tell their story. Idea 1: Dolphins are incredibly rude and should not be allowed to be anywhere near the public because they will corrupt society. Idea 2: Giraffes have incredibly unhealthy habits and are poisoning our bodies and minds. Idea 3: Ants are the most perfect animals in the entire world and we should all aspire to be like the ant. Idea 4: Elephants are the most brutal and violent of all creatures and must be destroyed. How were certain campaigns more effective than others? How was their assembly and petitioning effective?